One of the most visited and important landmark of Vishakhapatnam tourist circles, is the Submarine museum situated on Ramakrishna beach road. Which once, was used to tame the mighty oceans and roam freely inside the vast seas is now open to general public. This musuem has been crafted out of INS-Kurusura, which got decommissioned in February 2001 after 31 years of service to the nation. Till now I had read about submarines only in fiction stories and seen in movies like "20,000 leagues under the sea and League of Extraordinary Gentleman". This was the moment of cherishing the childhood dream of seeing a submarine. 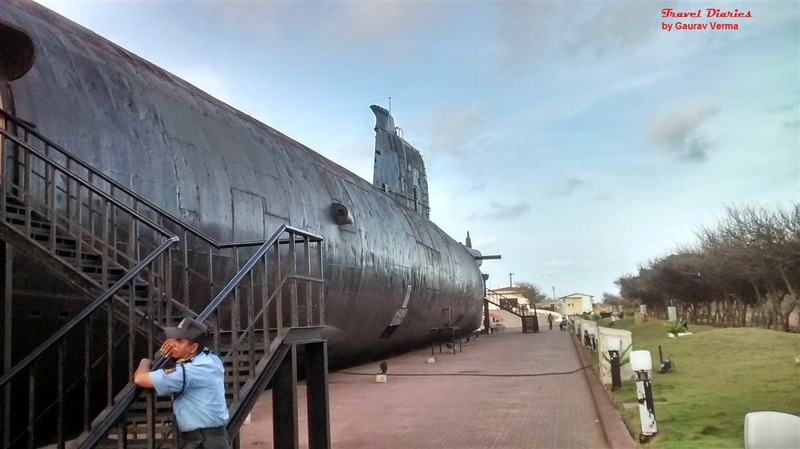 Everyone thinks that life of sailor is very adventurous, however after coming here we get to realise that "Life of a sailor is not easy", visiting this museum, one can get a look into the life of the sailors/ marines who used to stay in the submarine for 90 days at a stretch. Staying with live torpedoes. 6 torpedoes are kept loaded at front and rear side, ALWAYS LIVE. Though the submarine used to carry 36 tonnes of fresh water, however that was barely sufficient for drinking, cooking and washing face only. That means 72 sailors used to remain underwater for 90 days at a stretch without taking a bath and carrying 22 torpedoes to guard our nation. Despite being decommissioned, this submarine still receives the navy's "Dressing Ship" honour, which is usually only awarded to active ships, last one being at January 27th 2014. Next time whenever you see a defence person, convey your regards for his selfless service to make sure that we can sleep peacefully.